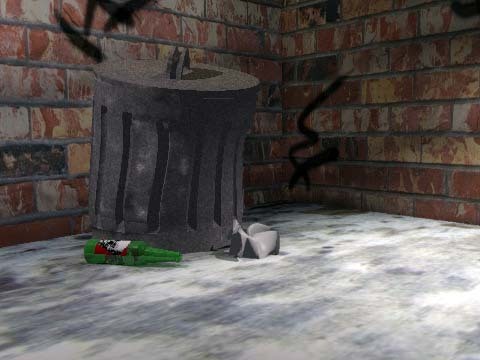 This is a test still for animation which was started with great enthusiasm and never finished. Thankfully, most of its plot has been lost to history. The bits which remain are dreadful. Virtual reality - VR for short - was all the rage at the time. It seemed a stroke of brilliance to animate a mongrel roaming around a city while wearing virtual reality goggles. Oh, the adventures he'd have! This image was meant to be the opening scene, a seedy cityscape with stained concrete, graffiti and filth. The dog was going to emerge from behind that rather squashed-looking trash can. Echoes of this grimy cityscape can be seen in All the King's Horses.